The Cheesecake Factory is certainly known for a lot of great dishes, but the one that got it started is the amazing cheesecake itself. When The Cheesecake Factory™ started the founders, Oscar and Evenlyn Overton were selling some of the best cheesecake exclusively to local restaurants when they decided to branch out and start their own restaurant. Today they’re consistently rated as one of the best places to spend an evening with friends as well as one of the most requested restaurant recipes. My wife and I recently ate at The Cheesecake Factory™ and decided to split and entree and then order our own desserts. We both walked out completely stuffed. If you’ve ever eaten there, you’ll know the portions at The Cheesecake Factory™ will blow you away. Unfortunately, as large as the serving is, it’s still almost $10 for a slice of cheesecake and for that amount of money, you could cook an entire cheesecake at home for your family. Please don’t be intimidated by the idea of cooking a cheesecake. It’s not as hard as you’ve heard. Just follow the instructions step-by-step and you’ll be fine. 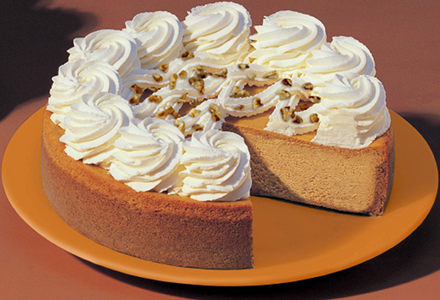 In fact, if go to my Cheesecake Factory Pumpkin Cheesecake, you’ll see a video where my daughter, 9 years old at the time, cooked a fabulous cheesecake, pretty much, on her own. She’s a very talented future chef, but I think you’ll see, it’s something you can probably do as well. Let all of the cheesecake ingredients sit out on the counter while you're making the crust. This will allow them to get to room temperature before you begin working with them. Do your best to make the sides even, about 1½" up the sides of the pan and then set aside. Using an electric mixture on LOW (this is very important) beat the cream cheese until light and fluffy. Add flour, vanilla and lemon juice (or zest) and mix on low. Add in the sour cream and mix on low until completely blended. Bake the cheesecake on the top rack of the 325 degree oven for 1 hour 15 minutes. Remove from the oven and let your cheesecake cool in the refrigerator for 24 hours. Keep in mind, the longer you let this sit in the refrigerator, the better it's going to taste. So don't rush it. Not adding flour is a great idea. I just did it the other day and the cake turned out even better than it normally does. It still feels like it's lacking something though. Leave the flour out if you want a creamier cheesecake. The flour turns it heavier and more "cakelike"
I made this recipe for my husband who is an avid cheesecake factory cheesecake lover. We decided that the original is a little creamier and are debating how to duplicate that creamyness. I followed the recipe exactly and the cheesecake is good...exact it is not. Any suggestions how to make it creamier?